After the garages were finished, Mister and I got to work on turning some of the old garage (that’s what we named the garage that was existing before he added the other two garages) into a temporary hobby room. It is the perfect place for Mister’s Amateur Radio and my scrapbooking and miscellaneous hobby stuff. It is a 32′ garage, so we took the last 10 feet and made that into our room. We’ve still got plenty of room for the parked cars, and Mister’s toolboxes and work bench. Mister told me to plan on two weeks for us to just get the wall framed and up. Sounded perfect to me! Turns out, we got it up in 24 hours’ time. We weren’t looking for anything fancy, just something temporary until the kids move out (the last kid leaves in 7 years, 3 months and 2 weeks… but who’s counting?! 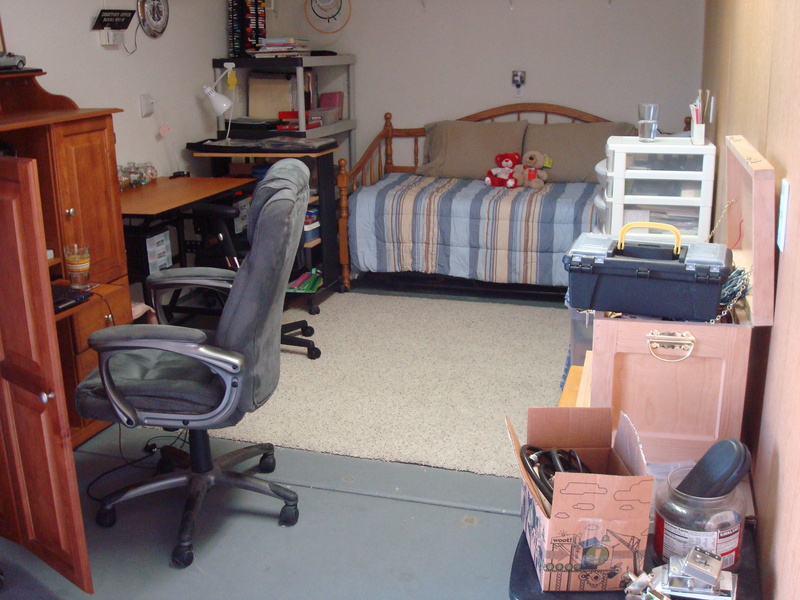 ), and then we can reclaim the two other bedrooms in the house. I told Mister I was perfectly fine with paneled walls. I was impatient for it to be done, it’s temporary anyway, and I didn’t want to deal with the messiness of the drywalling, mud, tape, & texturing process. So, in one weeks’ time we had the room completed. We didn’t get a big carpet remnant as we had planned, but that is no big deal to me. There is a fairly good sized scrap of carpet in there where I have my space, and that’s works out nicely. When we were moving our things into the room I made a comment about having the perfect spot in “my scrapbook room” for an item. Mister looked at me, smiled hugely and started cracking up. He just pointed a finger at me and said, “YOUR scrapbooking room, huh?! I KNEW you were going to try and claim the whole place for yourself! !” Against such a Freudian slip, I had no defense. We are very playful and tease each other a lot, so he wasn’t being mean and I wasn’t really trying to claim the room for my own. I am thrilled with being able to share a space with him, as I enjoy being in his presence as much as possible. However, to cover my little error in speech, I told him that we must rename the room and I jokingly called it “The Love Shack”. It was just a joke, but the name has stuck… Oh well, it’s cute, and I love it! The only thing missing is the wine fridge! Congrats on finishing the room! Great title and awesome slideshow!